Is it really okay to intentionally split an infinitive? That all depends on how you feel after reading the previous sentence. Many of us don’t remember too much from our grade school grammar lessons. In fact, the last time I can recall taking a test on grammar was in seventh grade. But I do remember that my middle school English teacher was adamant about not using split infinitives. Back in those days, I wanted an A more than a serious debate. Now that I’m an adult, I’m going back over the rules of the infinitive and coming to my own conclusion. What on Earth is an Infinitive? Good question. You’re probably using infinitives often when you write and speak but don’t even know it. Remind anyone of learning a new language? Even in English, we conjugate our verbs. That means you change the form of the verb to match the subject and the tense. So an infinitive is the verb before the conjugating. Unlike a lot of languages, infinitives in English is paired as two words: “to” and [verb]. When you drop that “to,” that’s what grammarians call a bare infinitive. When you split the bill with your friend at a restaurant, the server brings two checks broken evenly in half or by what you or your friend ordered. Either way, it’s two parts of the whole separated from the total. That’s how a split infinitive works. A split infinitive is when a modifier—usually an adverb—squeezes between “to” and [verb], thus breaking up the original infinitive. Sentence Using Infinitive: She plans to jog to the store. Sentence Using a Split Infinitive: She plans to briskly jog to the store. 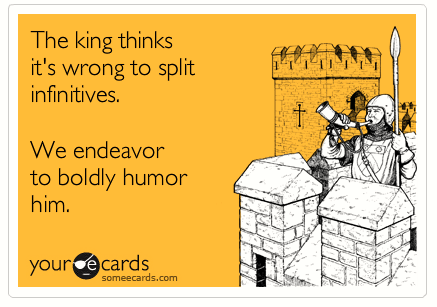 If a split infinitive appears in a favorite line from pop culture, surely it’s okay to use split infinitives. Right? Well, that’s been a heated discussion for some time. Look up many grammar books from much of the 20th century and you’ll find many scolding lectures on splitting infinitives. This is confusing to the English student who finds great authors like F. Scott Fitzgerald, Daniel Defoe and Thomas Cromwell who unapologetically split infinitives in their great works without any dispute from their readers. I get that adverbs can help intensive the meaning of a sentence. But shoving three or four adverbs between “to” and [verb] can be quite excessive. Here’s my point: James is going to meticulously, gradually and critically wash the inside of his car. Now the sentence is clunky and confusing. By the time you get to the word “wash,” you already forget who’s doing the washing. Let’s rewrite the sentence: James is going to wash the inside of his car meticulously, gradually and critically. Rule: Stick to one modifier when splitting infinitives. 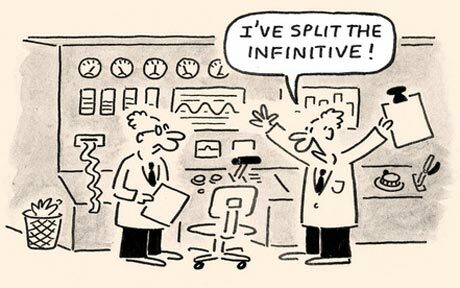 Should You Split an Infinitive? As long as it doesn’t hinder the comprehension of a sentence, I say split away! Just use one word to split the infinitive, of course. The meaning of a sentence can often be enhanced by splitting an infinitive instead of waiting to place that adverb at the end of the sentence. Then again, sometimes saving that adverb as the sentence’s last word sounds more eloquent. As long as it’s grammatically sound, use your best judgment. But that’s a decision best left to your inner editor. What do you think? 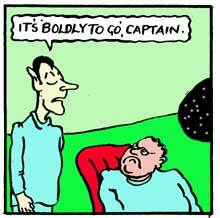 Is it okay to use split infinitives? Share your opinion in the comments section below. Here’s a terrific look at the infamous split infinitive — a minor sin, I’ve always thought. And I agree: if it feels good, do it!